Since the beginning of the Walmart parking lot, it seems like it’s been forever. Maybe it’s because there’s been a continual push to come up with solutions for people. As if the harshness of the fire wasn’t hard enough, winter is continuing to inflict pain. There are areas flooding, trailers stuck and with the blanket of snow things just come to a crawl. We don’t have to experience it directly because we live in our homes and we are blessed because we were not within reach of the fire. It seems like it’s been forever but it really hasn’t. We’re coming on just five months. With winter things quiet down a little bit. We all tend to huddle and move about a lot less. But for the victims of the fire, so much has not changed. The shelter closed down. People were pushed into trailers that were anchored into muddy fields. People who I am still working with are now in a homeless shelter. I’m very frustrated because I just don’t know if I have a solution for some of them. My mind operates like a boiling pot of water right now, constantly churning over. As harsh as winter is and as difficult as it has been, we’re still finding solutions, big and small. We are using the donations as frugally as we can and applying them as accurately as possible. Born out of a hellish night, thirty people hunkered down for 3 days, hoping to emerge. One of those people who survived that night at the church was Rusty and his children. Rusty and his family continued to stay at the church and unselfishly helped out with the fire victims as they arrived. He did whatever was necessary. Unloading trucks of water, sweeping, and cleaning. He stood vigilance over the tent. Your donations supplied needed items along the way until a solution could be found. Five months after it all began Rusty headed east with his family. 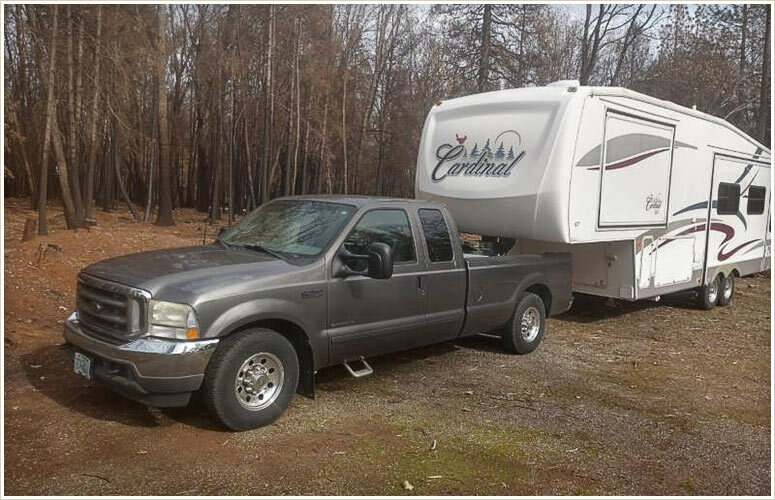 He had received a truck that was donated to us and with this they were headed to Kansas. This truck allowed him to pack up and finally move on. They headed south to Barstow at which point they would turn left and head to Kansas. As I’ve learned throughout this journey helping fire victims of the fire trying to get back on their feet, just fights until the very end. Just when I thought I had people taken care of, things consistently popped up. For Rusty, this was no exception. 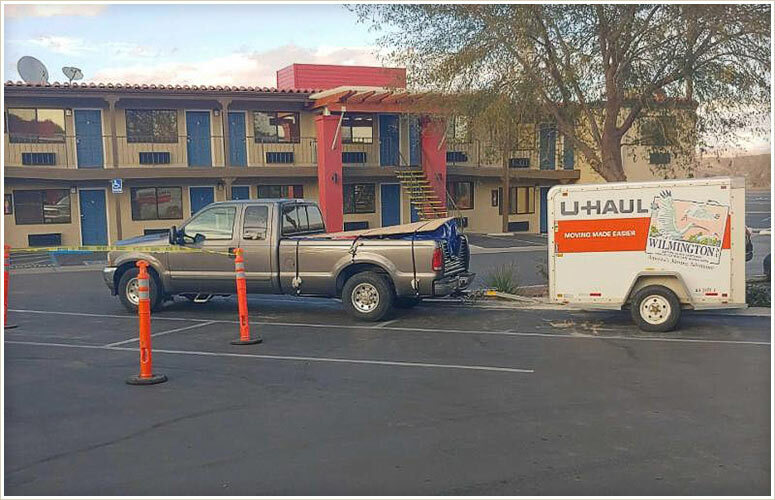 As luck would have it, Rusty broke down in Barstow and had to stay in a hotel for 2 weeks waiting for the truck to be repaired. You and I didn’t give up. We never abandoned Rusty. 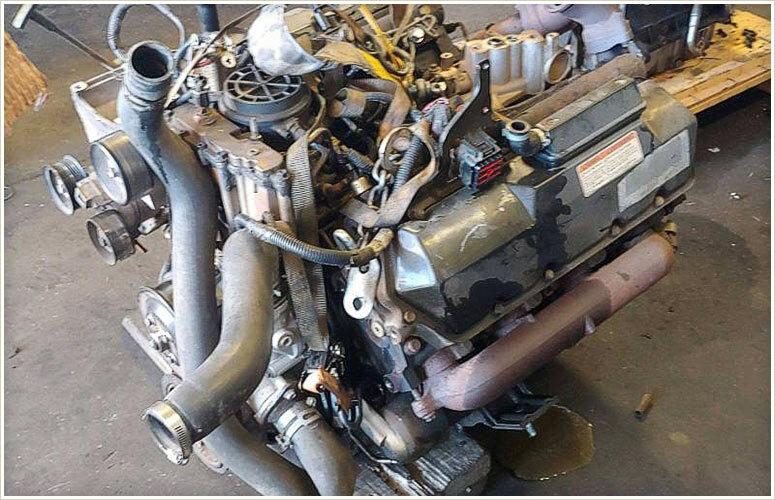 We got his engine repaired. We paid for his hotel. We fueled him up and out of town he went. I’m sorry but I could not leave him stranded in Barstow. I want to share a message that Rusty sent for all of you. Rusty checked in with me from time to time on his journey. I was nervous about the engine. I wasn’t worried about Rusty. He is a wonderful father and a hardened veteran of our military. He texted me a picture when he arrived with a message for all of you. It’s real simple. I would have not been able to get there without all of you and your donations. 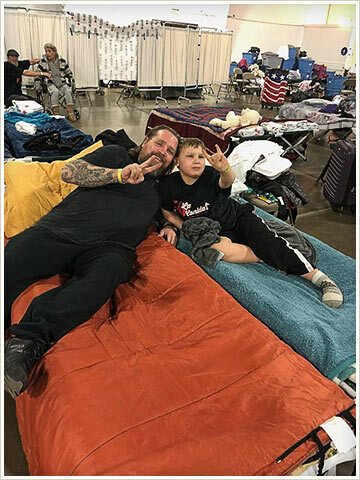 Luke and Colton moved from the shelter to the homeless shelter. Without a better option for now, it was really my only choice. We are making progress on his tiny house. He is staying positive and is excited for its completion. 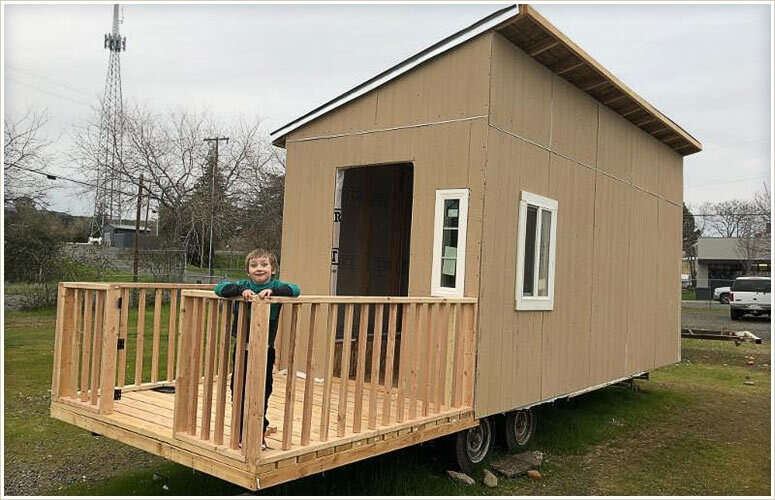 Your donations are funding four tiny houses currently. I’m managing the budgets the best I can with the donations I have. So far, so good. This will be Luke’s and Colton’s new home. I took this picture back in the beginning when we were helping Luke and Colton at the shelter. While they’re living at the homeless shelter now, they’re upbeat and positive. They are completely excited about their new home and are a complete joy to be around. I’ve learned a lot from them. I think we can all learn a lot from Luke and Colton. For those who don’t have a real good solution, this is the best one we can come up with and frankly I’m excited about it. You would think we are building a tiny house for this family of four, but I am standing next to Alicia, a mother of three. She alone has taken on the task of building these homes. She spends her off hours procuring materials, organizing volunteers and managing them. She, like myself, just dove in and went to work. All of you who have donated to me, should be proud of your accomplishments. 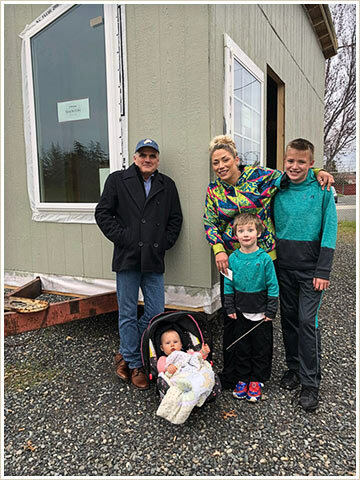 You are supporting Alicia and our dream of building tiny homes for those who don’t have a better solution. We are funding them step by step as we get certain phases done. As donations come in, we are able to fund additional phases of these homes. You are making this happen. You should be proud. From the first pick-up load of donations we took into the area last October, I had no idea it would grow into what it has today. While we are not running truckloads of supplies necessarily like we were back then, we are still hustling to find solutions. In the last few days we have purchased cars, propane, food, and insurance. We have paid rent and are continuing to repair cars that made it through the fire. We are paying for medical procedures to be done and fulfilling needs from the most simple to the most complicated. We have come up with solutions for people when no one else could. I have never looked at anybody’s problem as complicated. I just looked at everybody as an onion. Some just had more layers than others, but regardless we had to meet them right where they were at. There have been a lot of lows and highs throughout the last five months. Because of your donations, I am still meeting people right where they’re at and finding out how to come up with solutions when there appeared never to be one. If you feel so inclined to donate, you can. Either through the nursery or by phone. Please feel free to reach out. I hope I am doing good by you and I thank you for your trust and your support. After the agencies go home, after the news cameras go away, after the holidays, it’s so easy to step into normal life again. 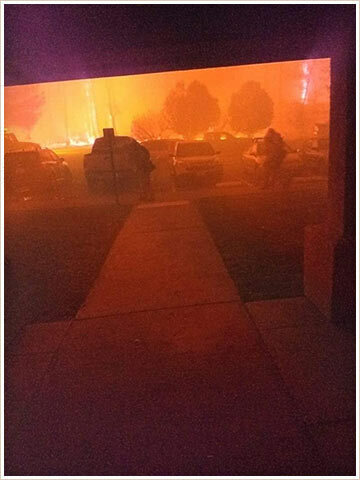 But for the victims of the Camp Fire, it’s not about stepping into a normal life. It’s about coming to peace with what a new normal looks like. For us, you and I, the work continues. I had a chance today to sit down and reflect about the last three months. For me, the last three months have been a blur. For the Camp Fire victims, it’s been a nightmare. For all of you who have donated, your donations have been transformed into blessings beyond what you can imagine. The shelter closes down this week. The trailers that are left at Silver Dollar can stay there as long as they pay $1200 a month and then in April they will have to move on. While so many have moved on, so many people are still on the treadmill, trying to find solutions. It’s still just as difficult as it’s always been, but giving up doesn’t seem to be an option. Your donations are still helping Red Cross Kim and the trailers and various people. Chico Tammy has a lot of layers to the onion, but we got her car registered and we found a way to get her two horses, three dogs, birds, two kids and a sick mother to her new job in Emerett, Idaho. Cowboy 911 is going to help with the animals and your donations are helping to get Tammy over the finish line. Our work in Magalia still continues. While conditions are harsh, through your donations, spirits have been lifted. Inside our oasis, we are continuing to feed and nourish. This will continue until Pastor Doug says we can take the tent down. Your donations will continue to maintain this effort until this very end. For those living in their trailers on their property in Paradise and Magalia, they now have to move off their property. FEMA has told County Supervisors that if everybody doesn’t move off their properties and find new places they will not receive the funds needed to start the clean-up. Understand that originally, officials said that they could move onto their properties while clean up was being done and rebuilding their houses. Now they have to move off. Still, they can’t get off the treadmill and find a new norm. It’s frustrating. I think we’ve turned a bit of a corner, however. It’s a simple observation. 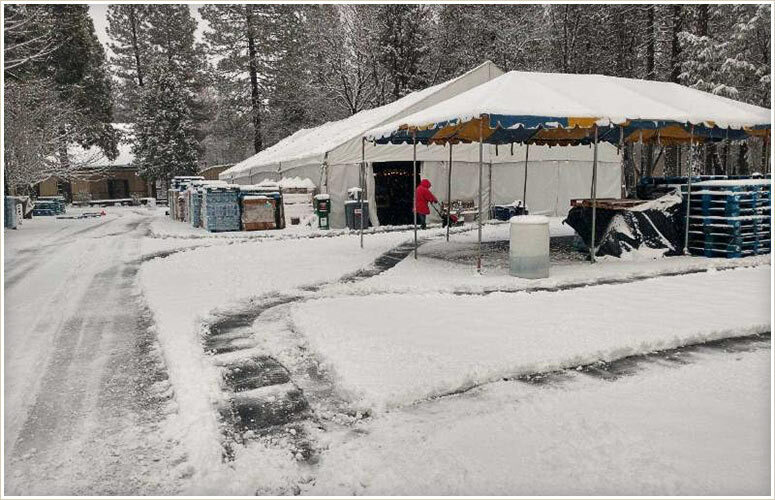 In the beginning when we were feeding people inside the tent, it was quiet. Not a lot of conversation. Not a lot of interaction. Strangers sharing a table wouldn’t even talk to each other. It’s changing. Now, people are talking, engaging, laughing a little bit. This is very encouraging to me. It may seem like a little thing to you, but it’s a big deal to me. I will take this as a sign of hope that all this is making a difference and that spirits are starting to lighten up. Shelly lost her job at the hospital and now has new transportation. She can go to her new job at a hospital in Chico. As an RN, she is the sole bread earner raising five kids, grandchildren and supporting her mother. 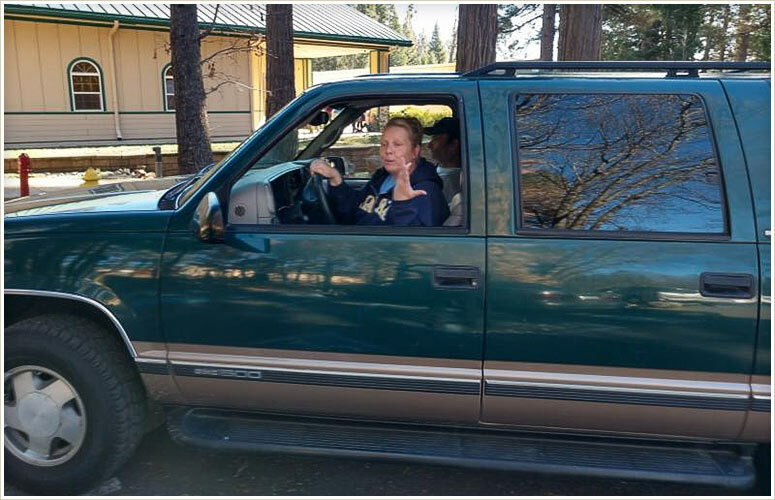 Your donations of the Suburban has been a life changer. This trailer is housing a family in Gridley on the property where he works. 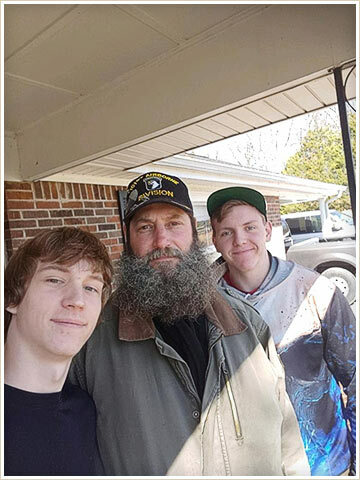 The truck is transporting a veteran and his family to a new home in Kentucky. I’d like to personally thank Tony for this donation. You have made a huge difference and I just wanted to acknowledge you. Acknowledging everybody and their hard work and donations, is almost impossible, so I hope that you forgive me and accept my apology for not being able to reach out individually. Please know that your donations have really helped a lot of people and will continue to do so as long as the need exists. As for us at the nursery, the work we are doing continues as well. Most of you who have followed us through these emails and our journey with the Camp Fire. I realize that a lot of you signed up to hear about what’s going on at the nursery. Our tips and tricks and fun and amusing tales. Like with the needs of the Camp Fire victims, the nursery is moving along too. I appreciate your patience, very much, in allowing us to bring this story to you. We will be installing a new fancy roof in our conservatory soon. The new surface let the same light in and reflect the heat away from the building. We are continuing to grow the same beautiful plants we always have. 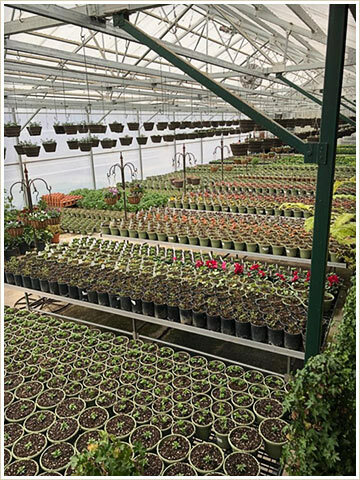 Our greenhouse is full of the latest and greatest flowers for Spring. It’s calming to walk through. There’s something about the fresh smell of dirt that calms me. You’re welcome to come to High-Hand and walk through and try it for yourself. Dori is still holding her fun and zany classes and if you would like to join us February 16th and February 23rd, please do. Painting and decorating a hand crafted bird house can be a lot of fun. 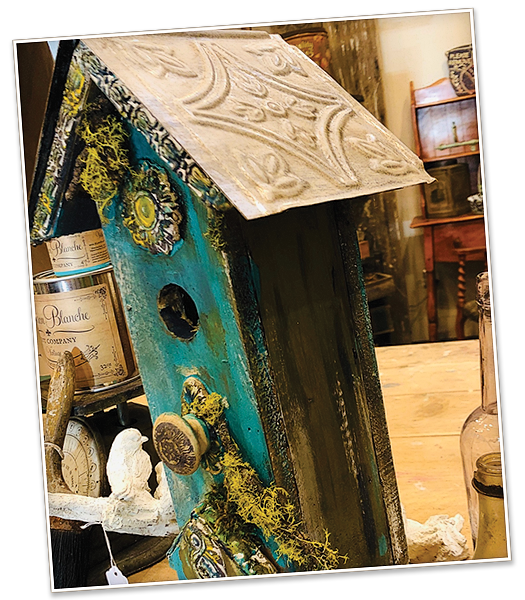 Learning fun techniques with chalk paint and ways to embellish your birdhouse will be “funner” with mimosas and fresh scones. You can purchase your tickets by clicking here. $65, plus tax and all the supplies you need. Tell Dori “hello” for me, if you would. 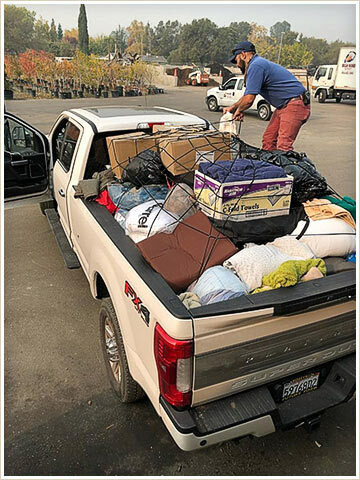 There are so many things that continue with serving the victims of the Camp Fire. We are continuing to seek out the people in the fringes by supporting the people of Magalia and help them find a new norm. There are victims who can’t speak for themselves. There are the animals who can’t talk. We are still providing livestock feed, grain and other necessities on an as needed basis within the fire region. Field Haven Feline Center has been taking care of 60-80 cats and kittens in Marysville and Lincoln. They are desperately trying to reunite cats with their owners, but as you can imagine there are many without homes. I would love if you would reach out if you are in need of a new friend. Field Haven can be contacted at 916-434-6022. I’d like to thank our ongoing partners. So many of you have donated. 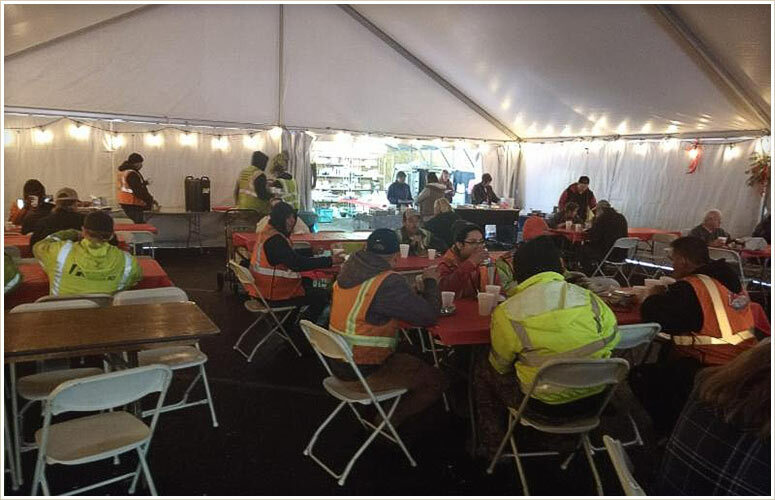 Teichert, Produce Express, Celebration Center and Livingston Concrete, Vanelli’s Coffee are just a few of the corporations that have unselfishly stepped forward. Thank you. Giving is not rocket science. You just have to do it, with kindness and compassion and without judgment. It’s very simple to take a moment to sit down and be with somebody right where they’re at. You just have to do it. Our work is not done. As Spring arrives, Nature will bring about new beginnings, not only here at High-Hand, but new beginnings for the people of the Camp Fire. Thanks to all of you, we will continue forward.